It has been well said that God always answers prayer. Sometimes He says, "Yes." sometimes He says, "NO." Sometimes He says, "Wait for a minute," and a day to the Lord is a thousand years to us (2 Peter 3:8). That means that a ten year wait for us, is 14 minutes and 24 seconds to God, so ask in faith, but rest in peace-filled patience. 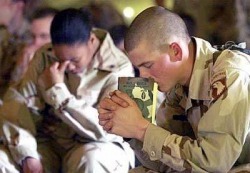 Surveys show that more than 90% of America prays daily. No doubt they pray for health, wealth, happiness, etc. They also pray when grandma gets sick, and when grandma doesn't get better (or dies), many end up disillusioned, and some end up bitter. This is because they don't understand what the Bible says about prayer. It teaches that sin will stop God even hearing your prayer (Psalm 66:18). It teaches, among other things, that if we pray with doubt, we will not get an answer (James 1:6-7).